Getting quotes: Get three quotes for each trade if you are employing subcontractors – the same applies if you are employing a general builder. Recommendations: Use people who have been recommended to you and if possible go and see their work. Contracts: Get a price for the job and a schedule of works from each trade – as well as a signed contract. Make sure they have covered everything in their quote so there are no nasty surprises. Communication: Make sure you communicate well with your subcontractors. Getting quotes: Some people won’t bother to get back to you at all, even if you do leave them a few messages (trying very hard not to hassle them) so it may be quite difficult to get three quotes. If your start date is looming and your wipeable wall calendar has its schedule mapped out, you may have to be extremely flexible with start dates – keep your wiping cloth handy. Some subcontractors are very professional however – you can tell by the state of their van. Recommendations: Even if people have been recommended to you and you have seen their work it can still go wrong, (see Communication). If you employ fabulous and helpful subcontractors you can then happily give their details to other people. Contracts: Some subcontractors may be slippery customers who say they will sign document to seal the deal, but in fact they will put it off for as long as possible or perhaps never sign it. They might then tell you that they haven’t accounted for this … and for that. Don’t be taken in by it. If they demand expensive fixings, stick up for yourself and get them to use cheaper ones. (Isn’t hindsight a wonderful thing)? Communication: It is handy if your subcontractors speak the same language as you. Then you won’t get annoyed while you undo all the work they have done that day – and then have to pay someone else to put it right. Make sure you are on site for any major decisions otherwise they may be made for you in your absence. Mark out exactly where things should go, and say if you want to keep a particular tree (put red and white barrier tape around it as a reminder). Remembering how many sugars a subcontractor has in their tea will give you lots of brownie points. Providing their favourite biscuits will help too. 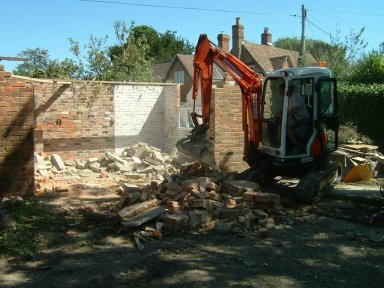 Never interfere with a subcontractor’s lunch break, but do ask them politely not to put foreign items on your rubble pile. This is a picture of one of our excellent ground-workers – highly recommended! This entry was posted in Building tips, Self-Build, Site management, Uncategorised, wall calendar and tagged Builders, communication, contracts, how many sugars?, in an ideal world, In real life, recommendations, rubble pile, schedule of works, subcontractors, top tips, Top tips for self-builders, wall calendar, working with builders on 22nd July 2015 by Mandy Clark. Do you want an oak framed garage too?